This little service station from the past is preserved along Truner Mountian Road. It's easy to imagine it's Wally's. Not far away would be Check Point Chickie. "Welcome to Checkpoint Chickie" -- Go out Old Highway 601 and ride over part of Turner Mountain. You can't say you've been to Mayberry unless you've been over Turner's Grade. But remember, it's marked with "big 3-5's" and you never can tell when a deputy camouflaged as a bush might stop you. The David Mendlebright Memorial Horse Trough -- Go out East Pine Street to the Mount Airy Granite Quarry. (You don't want to miss the chance to see what is said to be the largest open faced quarry in the world. It's been worked since 1775 and they say the vein of granite is deep enough to mine for another 500 years.) Just across the street from the main office of the quarry is a horse trough that might have been the inspiration for the Mendlebright one from which Briscoe Darling filled his car radiator. Don't dip your hat in -- remember, that's how Briscoe got in trouble in the first place. The Mayberry Collectors Center -- On Main Street across from Snappy Lunch, this store is a surprise for a town the size of Mount Airy. One might expect to find it stocked to the rafters with "Mayberry-ana." Not so. There's one corner full of Mayberry items, some of them available only in this store. Also in this corner is a collection of "I Love Lucy" goodies. The rest of the expansive store has everything from Barbies and Beanie Babies to Christmas ornaments and Christmas village pieces. The owner was "born and raised" in Mayberry and more than happy to accommodate shoppers' needs and answer their questions. This also is the spot to get the least expensive Mayberry souvenir -- a "smooshed penny" embossed with words and pictures to remind buyers where they got it. The cost? 51 cents -- a penny and 50 cents to "smoosh" and emboss it. Snappy Lunch -- The eatery proudly boasts that it was the first Mount Airy business mentioned on "The Andy Griffith Show" and that is was mentioned by Andy himself. It also is proud of the fact that it's the home of the "famous Pork Chop sandwich." 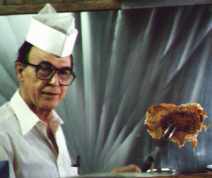 The record for pork chop sandwiches eaten in one sitting is enshrined on the wall -- the number to beat is five. If he's not busy frying up a mess of bacon for the breakfast crowd, owner Charles Dowell may come out of the kitchen and say hi. Otherwise you'll have to be content to eat in a place that hasn't changed much since Andy ate there as a boy. Located on Main Street, the restaurant opens at 5:45 a.m. Monday through Saturday. Closing time is 1:45 p.m. on Monday, Tuesday, Wednesday and Friday and 1:15 p.m. on Thursday and Saturday. Andy Griffith Playhouse -- Part of Rockford Street School, believed to be Mount Airy's first public school, is incorporated into The Andy Griffith Playhouse. Andy Griffith attended elementary school here and performed on stage here during the 1930s and 1940s. The Surry Arts Council leased the building in 1975 and renovated it into a theater and arts center. The building was named in Andy Griffith's honor during the early 1970s. The Playhouse is located at 218 Rockford Street and is open Monday through Friday from 8 a.m. to 5 p.m. It also is home base for the festivities during Mayberry Days. Grace Moravian Church -- Andy Griffith attended church here as a youngster. He joined because of teh music and played in teh church band until he went away to college to become a Moravian minister. He would bike the two miles from his home to the church to take music lessons. In the bandstand episode on the show, Andy plays the sousaphone -- and that's what he played in the church band. In addition to being Griffiths boyhood church home, it also is a fine example of the use of one of the most abundant local resources, granite. The structure is located at 1401 North Main Street.